Have you ever read articles or interviews where they talk about electric guitar amp sound and use terms like saturation, mids, gain and sustain? Did these words leave you scratching your head wondering what the heck they're talking about? Good, I'm not alone! We're gonna try and dispel some of the mystery about the "terminology of tone" here today. If you look at the front of an amp and want to understand what tweaking the different knobs will do to your sound, this article should help you out. Let's start with the basics. To get electric guitar amp sound, you really only need two things: the input jack and a volume control. In fact, in the beginning, amplifiers only had these two components. The jack is where you plug your guitar cord in (running from the output jack on your guitar). The volume control does just that - controls the volume level. The higher you raise it, the louder it gets. As demand for amplifiers grew and electronics technology got better, manufacturers started adding more components to their electric guitar amp offerings. You started seeing treble and bass knobs to control high and low frequencies, respectively. Then the midrange frequencies got their own control knob. If you've ever heard about equalizers, or EQ, these are devices that let you adjust frequencies, so treble, bass and midrange are your EQ settings on your guitar amp. Treble is used to boost the high frequencies. So if your guitar sounds "muddy" or thick and notes don't have a "bright" tone to them, turn up your treble control to get a clearer, brighter sound. Sometimes, a reference to "presence" will pop up. This is a control that will boost the higher frequencies even more. It's supposed to make the tone even brighter, or "crisper". Conversely, if things sound too bright and thin or tinny, you can add the bass frequency by turning the control knob up. This should make your guitar sound fuller with more body to your sound. The midrange, or "mids", knob controls the middle sound frequencies. Turns out this is very important control for your electric guitar amp sound. Don't freak if your amp doesn't have a mid control - it could be that the treble and bass controls just cover more frequencies. This will give you a little less variety in the tones you can produce with your amplifier. Heck, on some of the small practice amps like the Roland Cube, you only get a "Tone" knob for control. Cranking your mid control all the way down will give you a very deep, grumbly tone that's great for metal and punk. If you ever hear someone talking about a tone being "scooped" they're talking about the mids being very low. Turn mids up to give your electric guitar amp sound a very classic rock, 70s tone. You can also get your British rock sound with this mid setting. Nowadays, most amplifiers come with a control knob for distortion. It seems like no one can decide on a common term for this, so you might see the distortion knob labeled, uh, Distortion, Overdrive, Drive, Dirt or Gain. Take your pick, they all mean pretty much the same thing! Here's a common amplifier control panel. Notice that each channel has its own volume control, along with Treble, Mid, Bass and Gain. This is in addition to a Master Volume control to handle the overall volume of the amp. As you get into multi-function amplifiers, most manufacturers offer amps with multiple channels. This gives you the ability to set two or more different output sounds and switch between them. Channels are usually labeled based on their main tone. For example, you'll have a Clean channel, then maybe a Lead channel. If you have a third channel available, it might be called Crunch, which set the Gain somewhere in between a Clean and Lead tone. You saw a multi-channel example above. The Lead channel must add presence to the tone, as it tends to be a brighter, more cutting tone. This way your lead kind of "stands out" from the rest of the song so people hear it better. Sometimes you'll hear the term saturation. Saturation is the when the tubes of your electric guitar amp are pushed to a point where they are overloaded with a signal, or "over-driven" to a point where distortion is the result. If you don't have tubes in your amp (i.e., it's solid-state), then you're overdriving transistors. 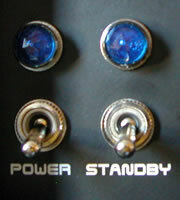 When you're dealing with higher-end gear, you'll typically find a Standby switch on your tube electric guitar amp. This switch allows you to keep the tubes hot while you take a beer break or whatever… This way you don't need to shut the amp down. It's also handy if you're swapping guitars in the middle of a set. The last thing we'll talk about is Reverb. Reverb creates the effect of depth (which it is sometimes called). Think of it this way - you want to sound like you're playing in a larger room. Reverb creates the illusion of distance, like the amp is far away. It's a cool effect, and adding a little reverb really helps boost your tone. If you happen to be lucky enough to have an amp with an old-school spring reverb tank in it, you can recreate the sound of thunder. I used to have a Lab Series L5 amp, which had spring reverb. If I gave it a kick to vibrate the spring, it sounded just like a thunder clap. I used to use this effect to play "Chain Lightening", by .38 Special. Check out this informative video on how to use your electric guitar amp, which demos much of different controls we talked about here. Hopefully this was helpful to you.